People often ask me for restaurant tips. Give me a price range, location, and maybe a cuisine preference, and I'll give you a menu of options. Last week, I needed to give myself some restaurant advice. I wanted to take out a couple of high school friends, Adam and Steph, who came over to surprise me for my birthday. For the event, V threw me a surprise party at Osteria da Clara. Everyone loved it. But a few days later, I was lacking dining ideas. My two friends are New Yorkers who didn't want to spend a fortune, but I wanted to impress them. For some reason, I couldn't get the perfect choice to pop into my head. 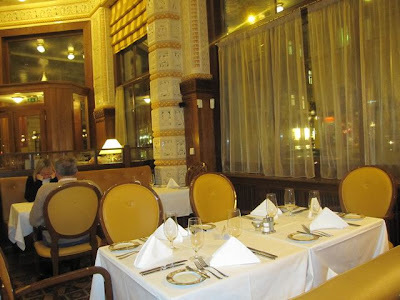 In the end, I chose Café Imperial, which is part of a hotel in the center of Prague. 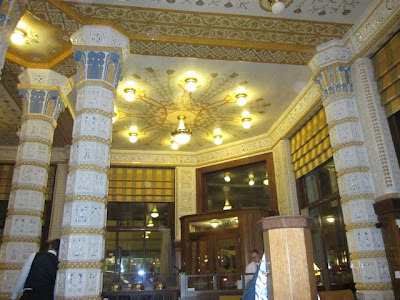 I settled on this place for its interesting ceramic tiled interior and its not excessively priced menu. I'd never been terribly impressed by the food, but I hoped for the best. The very pleasant host, I believe it was the manager, sat us in the center of the dining room. The bread in the basket that came soon after was cold and just average. But we all loved the spread that came with it. Our host proudly told us it was made from a special recipe that included smoked ham, cheese, mustard, horseradish, pickle, onion, and egg. Quite a combo. But be aware, there was a 20 CZK per head cover charge. 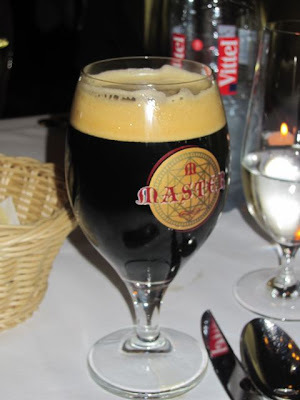 Adam and I felt like a beer and he wanted something different, so we each had a Master 18°, a strong, dark beer from Pilsner Urquell (.4 liter/60 CZK). It has a hint of coffee flavor at the finish and a very nice head. We both enjoyed it. Steph had a .15 liter glass of a New Zealand Sauvignon blanc, but I don't recall the label. She had no complaints about the drinkability, but the 190 CZK price tag left me with some sour grapes. We ordered a large bottle of water to go with the meal. 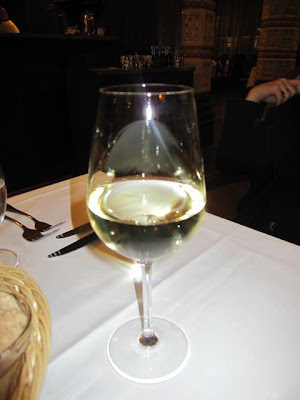 The waiter brought a one liter plastic bottle of Vittel (145 CZK). Plastic? I'd never seen that before in presumably upscale dining establishment. Adam also joked that one of the only times he'd been given cloth napkins with a meal in Prague was during brunch at our place. 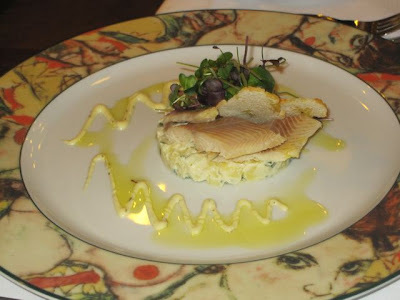 For a starter, Adam had the smoked trout (185 CZK). We both liked the salty fish, though it was nothing exceptional. He enjoyed the potato salad with quail egg underneath more than I did. I thought it was way too sweet. Steph got the goat cheese salad (195 CZK). 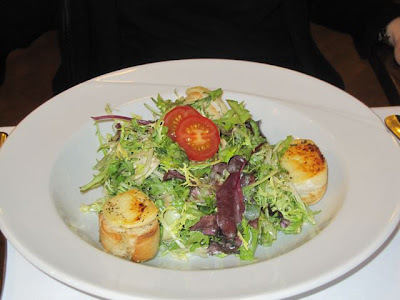 I had a bite and really enjoyed the vinaigrette and honey dressing. It was also sweet, but balanced with vinegar tartness. The quality greens were dressed with just right. The goat cheese was well-toasted on small circles of bread. But it was not so large, and wouldn't look too cheap for New Yorkers thinking in dollars. 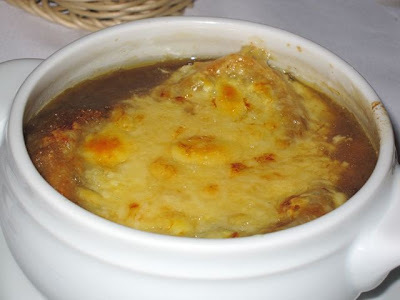 I had the French onion soup gratinée (85 CZK). This was the closest soup I've had to the French onion soup of my restaurant youth -- something not so usual in Prague. I liked it, but wished it was better. The whole thing could have used a flavor boost. The melted cheese over toast had the perfect consistency, but was bland. I thought the browned onion broth could have used a shot of wine or dry sherry. It was too one-dimensional. 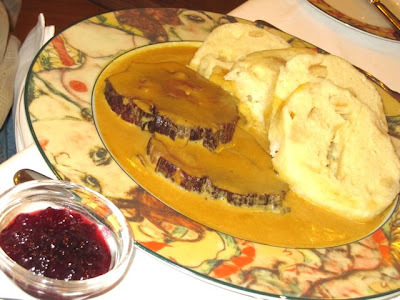 For a main course, Adam got the classic Czech dish he'd wanted since his last Prague visit -- hovězí svíčková na smetaně (189 CZK). Unfortunately, it was far from the best version I've sampled. The braised beef was on the tough side and, despite being under liquid, seemed dried out. But I really judge this dish by its veggie-based cream sauce. On this score, I found it thin and boring, with a hint of sweetness but not much else. The dumplings were nice, and it came with quality cranberry sauce. I was disappointed it wasn't better. They were offering a few game dishes. Steph couldn't decide between the wild boar and the Zajíc Royale -- the hare. Our host recommended that hare, saying that was his personal favorite. So, hare it was (369 CZK). It came with egg noodles. She wasn't happy with it. Steph said it was dry and the meat was stringy. I went for the deer (355 CZK). The meat was tender, but bland. It desperately needed salt. 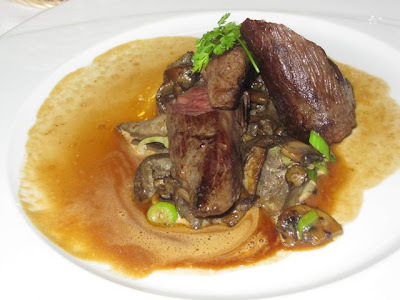 Also, it didn't have a lot of gaminess -- it could have easily been mistaken for a small, lean beef tenderloin. I was told it was served medium rare, which was fine. Two of the thicker pieces had red/pink centers. But the thinnest piece was cooked all the way through, which was a shame. The mushrooms and sauce underneath had potential, but also needed more seasoning. There was no side item included in the price, so I ordered scalloped potatoes at an extra cost of 53 CZK. They were way too garlicky for my taste, and the top crust was dried out. It seemed like they'd been sitting under a heat lamp or in a stove for too long. Overall, I didn't think this main course was worth over 400 CZK. Our total tab for the three of us came to 2205 CZK. I quickly noticed that a 200 CZK or 10 percent service charge was included in that price. That's how much we would have tipped anyway, but I don't like service charges being decided for me in advance. It's understandable for large parties, but not as a rule for all diners. Very annoying. If the service was poor (which it wasn't), I'd have to go through the awkward situation of paying less than what is printed on the receipt. I think that is presumptuous and rude. 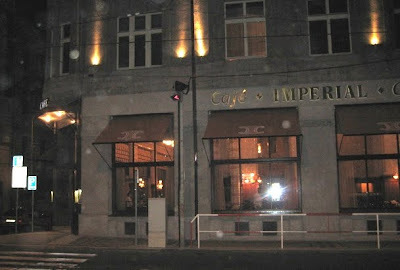 My feeling about Café Imperial is that it is a cool looking place with generally good service and good presentation. The food looks nice on the pretty plates. They have some bargains, but if you're not careful, the costs can add up quickly. That may be because of an unexpectedly expensive glass of wine, or side orders that aren't included in some pricier offerings. Most critically, I've been to this restaurant three or four times over the years and while far from all bad, I've eaten too many dishes that just didn't taste very good. Yes I enjoyed Master. Drank it in Praha Airport departure lounge though, so paid big Price !. As you say, it would seem awkwark. How do you make it less so? 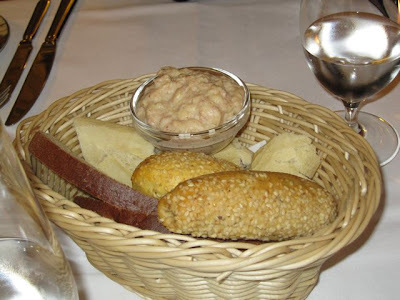 Bread is often cited as a reason for a cover charge, but there can other reasons. It could just be for general costs -- and to be legal, it has to be written somewhere on the menu. Many restaurants in the tourist center or higher end places have people who speak English. The best thing to do is to ask about it at the start of the meal. Do try to avoid restaurants right in the middle of tourist attractions -- restaurants a few blocks away on side streets will be much cheaper and less prone to trouble. As for bill disputes, I often look at bills and find errors. They are usually cleared up after pointed out. If I disagreed with a service charge being too high -- I'd try to find exact change and leave an amount that just covered the food and go. There is no law saying you have to pay a service charge. 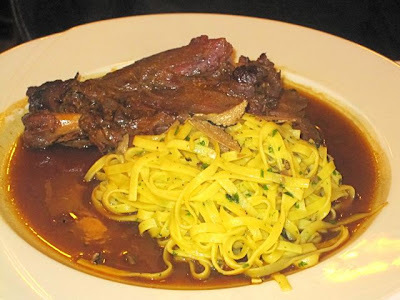 Next time, if there will be one, order the Braised Veal Cheeks. Really tasty.. I tried it last weekend. And I forgot to have a look on the bill, so I do not know if there was also the service charge. I was with my girlfriend (she is Czech) and then , surprise, surprise, many times there is no service charge. 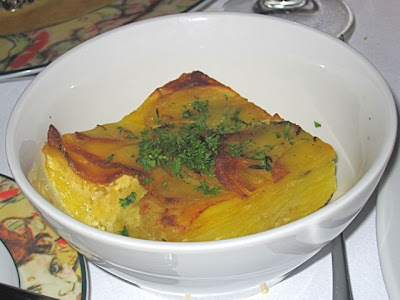 Sorry to hear about the svickova -- one of my favourite dishes and one I'm consistently disappointed by in restaurants here. I trust you know, Brewsta, the best svickova in town is at Cafe Savoy (make sure to order the one from Gourmet Menu). It's actually better than some homemade that I've had. It's about 400 kcs though, so beware. Happy to hear of other suggestions for places to try it; anyone? 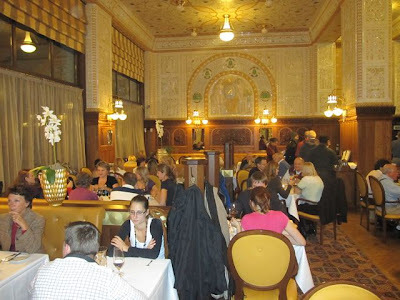 I've actually never eaten at Cafe Imperial; I remember it was closed for years after The V [ha] Revolution and when it finally reopened it just never seemed a place to eat. I've had plenty of drinks there though and it's a beautiful place to visit.